Patrick Amuriat has been sworn in as the new president of the opposition Forum for Democratic Change at a ceremony being held at the party headquarters in Najjanakumbi. 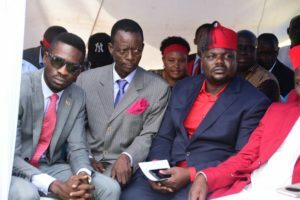 The ceremony has been conducted by the party lawyer Ladilus Rwakafuzi. 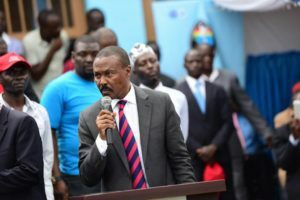 Speaking after taking oath, Amuriat has assured his predecessor Maj. Gen Mugisha Muntu to keep the party intact, asking him not to leave the party as has been rumored because he is a great asset. Amuriat added that Gen Muntu had lost before but had kept in the party so this small election should not have a huge impact on him. He has revealed plans of establishing a reconciliation and harmonization committee so that Gen Muntu and others who are aggrieved to be hard. Others who have been sworn in are Francis Mwikyukye as the new deputy treasurer and Habibu Muwembo as the secretary for labour and pensions. Mwikyukye has committed to giving the party 1million shillings every month as he leads the fundraising drive for the party. Earlier, the Forum for Democratic Change National Chairperson Wasswa Biriggwa called for unity. Biriggwa urged the new party President and his team to put away personal differences and work to unite the FDC. He has also commended the outgoing party president Maj Gen Mugisha Muntu for building party structures at the grass root.